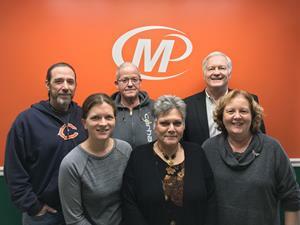 Meet the Team of the Minuteman Press franchise, Barrington, Illinois - L-R: Derek, Jenelle, Bob, Joyce, and owners Gary and Nancy Kreuz. /EIN News/ -- The last company to benefit from his talent was stagnant until he joined them and helped take sales from a million and a half up to seven million. It continued to grow even as his professional trajectory changed when his position was eliminated and he was let go. At that point, he and his wife Nancy took a hard look at their options and were determined to find something that would ensure no one could lay either of them off ever again. “I expected to spend 8 more years working at that German company, but when I was terminated at age 62, I realized that even getting an interview much less another job with similar income and responsibilities to what I had previously was impossible. I was doing very well in my career, but suddenly, when I needed a new position, no one would hire me. Essentially, I was forced to be an entrepreneur. I knew I needed to find a way to hire myself." While Minuteman Press in Barrington remains a family-owned and operated small business, Gary and Nancy are able to provide a wide variety of products and services such as printing essentials, promotional items, branded apparel, signs and banners, direct mail marketing campaigns, and custom graphic design. The community of Barrington is smiling brighter as Gary and Nancy join fellow Minuteman Press franchise owners who can say We Are the Modern Printing Industry since they can produce anything you can put a name, image, or logo on. It is a delightful switch from his prior industry to marketing services as Gary gets the pleasure of observing happy customers as he delivers just what they need. “It is fun to watch customers open packages and rave about the jobs we do for them. I deliver many completed jobs, calling and offering to visit and most welcome me to come; but they like to come to our center and see us, too.” There is reason. The previous owner didn’t offer nearly the range that Gary and Nancy have now and they put it all into a beautiful setting for everyone to see as they walk inside. “The now retired owner didn’t offer promotional products and now that we offer a lot, we updated our lobby for comfort and to display everything, making it more professional. It is a showroom with samples of products and apparel to see, touch and discuss,” Gary explains. In addition to providing new products and services, Minuteman Press Barrington recently acquired local print shop Forrest Press. This helped the owners retire and eased the transition for long-time customers. Gary and Nancy Kreuz’ family-owned Minuteman Press franchise is located at 200 James Street, Barrington, IL 60010. For more information, call 847-382-1185 or visit their website: https://barrington-il.minutemanpress.com. Minuteman Press International is the number one rated business marketing and printing franchise that offers world class training and unparalleled ongoing local support. Started in 1973 by Roy Titus and his son Bob, Minuteman Press began franchising in 1975 and has grown to nearly 1,000 business service franchise locations worldwide including the U.S., Australia, Canada, South Africa, and the United Kingdom. Minuteman Press is ranked #1 in category by Entrepreneur 28 times and 16 years in a row, including 2019. Independent franchisee satisfaction firm Franchise Business Review has also named Minuteman Press International to its 2019 Top Franchises, 2018 Top Franchise Leaders, Top Franchises for Women, and Top Franchises for Veterans lists thanks to positive reviews from our owners.